‘Human Centipede 3’ Might Be Delayed Indefinitely!!! With about six weeks left until shooting begins on the 3rd and final ‘Human Centipede’ film, things have come to a grinding halt. 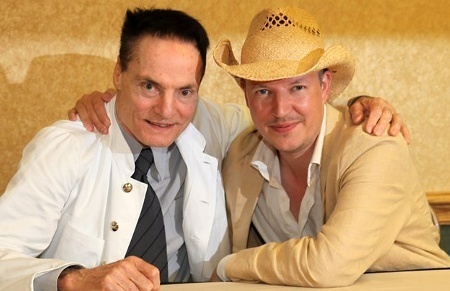 We have reported that director Tom Six will have a 500 person centipede for his final act in the trilogy and had Dieter Laser (the original surgeon villain from the first film) to star in the third movie. Now it seems that Dieter has pulled out of the film last minute and Tom Six and his company are not happy at all about it. Six is so unhappy, that he and his company are suing Dieter Laser for backing out of the film after he signed a contract to star. And if this does actually go to court, that will put an indefinite hold on the production and release of ‘The Human Centipede 3’. I can’t see a relationship with Laser and Six after this, which means rewrites and more prolonging the future of the final ‘Human Centipede’. Tom Six’s company will sue Dieter Laser. photography will be postponed and will take place later this year. Wow. I hope everything goes smoothly. Film Review: ‘The Human Centipede 3: Final Sequence’!! See The First Image from ‘The Human Centipede 3’!! Interview with Tom Six, Director of ‘The Human Centipede’ Films! Check Out The Trailer For ‘The Human Centipede 3’!!! This entry was posted on Friday, March 30th, 2012 at 3:18 pm	and is filed under Film, News. You can follow any responses to this entry through the RSS 2.0 feed. You can skip to the end and leave a response. Pinging is currently not allowed. « Check Out the ‘Walking Dead’ Season 2 Blu-Ray Set!!! She's the village bicycle! Everybody's had a ride.